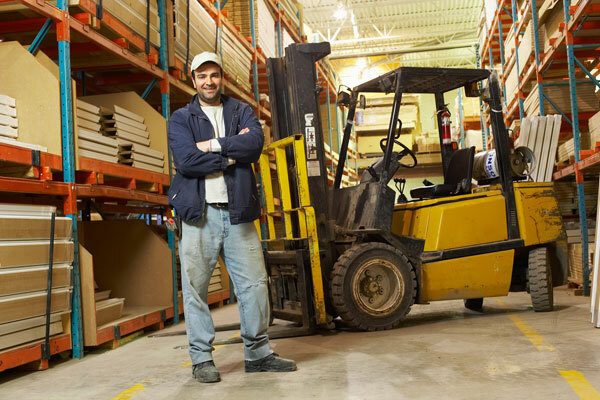 After receiving your forklift certification in New York City, landing a fork lift operator job can be very challenging but at the same time can be very rewarding too. In order to find one of these coveted jobs, you need to take the necessary steps in order to receive your certification because the law is very clear about this. The operation of a powered industrial truck without a proper license is strictly prohibited by OSHA. So getting forklift certified is the very first step towards securing a forklift operator job. In this article, we will go over all of the requirements of getting the forklift certification in NY and the steps involved in the process. Not only that but we will also cover all of the awesome benefits that a forklift operator will receive in this state. Also the expected salary of forklift operators in New York and when and how to get your license renewed. 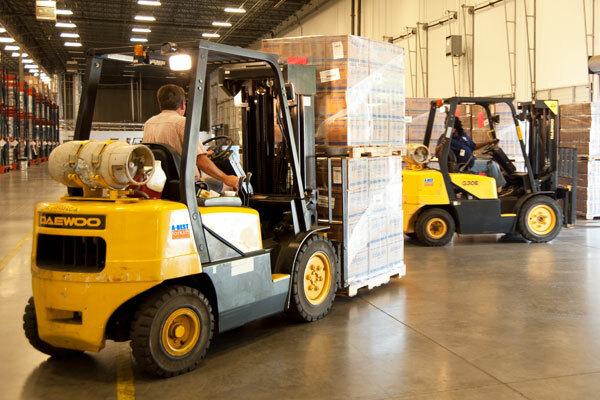 Do you have the know-how to become a fork lift operator in this exciting field? Although this is a very popular career, not just anyone has what it takes to land one of these jobs. There are several requirements in New York State that are mandatory in order to get your forklift license. We will list the general rules, although there may be more depending on the training academy that you choose may request more. By law, one must be of age (18 years old) in order to achieve a certification and operate a fork lift. According to OSHA, in order to drive a fork lift, one must obtain legit training from a qualified individual and to get a license. Although a forklift license is required, a New York driver’s license is not, but most employers like an employee to have one. A person wishing to get a forklift license should have a squeaky clean criminal record and be free of any substance abuse problems. Be sure to bring your safety wear, such as a hard hat, bright vests, work boots and safety goggles. Most instructors in New York will not accept you if you do not have all of the requirements on this list, so be sure to come prepared. Not only are there laws, but there are also certain personality requirements to be able to be a great forklift operator. The first thing is you have to be a person that follows the rules well. This is especially important to this field because not following the rules could result in a severe body or property damage. Also being a great team player and communicator is crucial to making it in this field. Without proper communication and working together as a team, you will be compromising the safety of yourself and others. Also keeping track of all of your cargo is your sole responsibility, and is no easy task. In order to accomplish this, you will need to have an organized and careful personality. If you still think that you have all of these requirements and personalities, then you are ready to begin your new career! So you are ready and willing to head out and start training on a fork lift. Not so fast, before you land yourself a forklift job, you will need to obtain your license first. There are several steps that you will need to follow in order to get your certification. First of all, you will need to find legit OSHA forklift training classes in NYC. Just do a simple search on the internet for “forklift training school near me”. Make sure you look at reviews and pick one that is popular. You can always call and ask the company you wish to work for if they do forklift certification training on site or if they have a reference to a particular training academy. The fork lift school must offer you a three part course: classroom training, written test (the forklift training test), and evaluation. The first part is the classroom training, in which instructors will go over all of the basics of a forklift. They will teach you all of the controls used to operate a forklift effectively. They will also go over maneuvers that you will use when on the job, including reversing, travelling with a load, and picking up and dropping off. Most importantly the classroom portion must contain all safety rules and OSHA regulations. After the classroom lecture, you will then need to take a written test on everything you learned so be sure to pay attention! After successfully passing the written test, you will need to practice on the fork lift and pass an onsite evaluation. This evaluation makes sure that you know how to physically operate a forklift. After taking and passing all three parts of the course, you will then be given a certification and official licensed operator card. This OSHA card will be your ticket into your dream forklift job, and without it, your chances of being hired are slim to none. This card will be good from the issue date up to three years; we will talk more about why this is later in the article. To obtain your forklift certification in New York, you will need to enroll in a OSHA forklift training class and complete your training. Here is a list of forklift training schools in NY state where you can get your forklift certification. Fork lift training schools in the alphabetical order. The list of forklift training classes and schools was last updated on April 1, 2019. If there are any inaccuracies, please report it to us. So you worked hard to obtain your certification, and now you are wondering if you will be able to find a reputable forklift job in New York. The good news is that the odds seem to be in your favor! The state of New York, being close to Canada and having ports up and down the coast, has plenty of warehouses. This is a good indicator that there are plenty of jobs to choose from. There are especially many opportunities within one of the most populated cities in the world: New York City. People, all over the world, know about New York City and is also known as the city that never sleeps. The name alone implies that there are plenty of industries and products that need to be moved at all hours of the day and night. With all of the movement of product in and out of the city, there has to be warehouses to store the cargo in between stops. 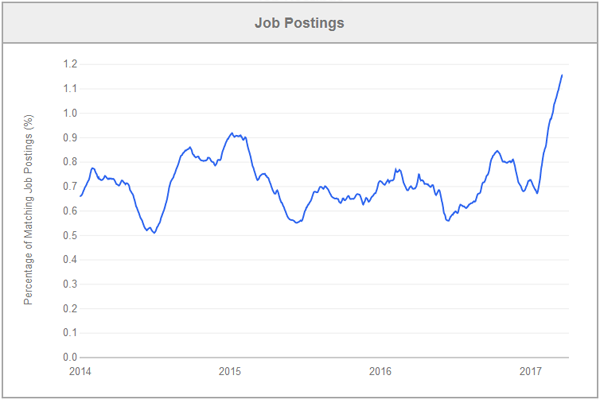 This graph from Indeed job board shows that there’s an increasing demand for certified fork lift operators and it’s not slowing anytime soon. Not only that, many of the big companies have their own warehouses that they use to store their merchandise. So this is another great sign that there will be a great pick of fantastic warehouse jobs. To add to the job market, there are many big league companies that reside in New York such as one of Anheuser-Busch’s main offices and the Coca-Cola bottling company. With Anheuser-Busch located in the Bronx and the Coca-Cola bottling company positioned in Queens, these are prime locations. Big companies like this offer very competitive benefits and top-pay, but require being well trained in return. Try searching for other big companies located in the city, or even on the outskirts of town. Try specifically looking for warehousing jobs within the main ports up and down the coast. Visit company’s websites and call the HR departments to look and inquire about any open positions. There are many jobs in New York to be had with the right certifications and if you know what you are looking for. Also, check out how to write a perfect forklift operator resume. Just don’t wait too long to apply, as these jobs go as quickly as they come. Getting a forklift license is more than worth it, and will prove to not be a waste of your time and effort. A license is almost always required of anyone entering the job field. Without one you are more than likely going to be turned away, so don’t even try to apply without one. A license shows the employer that you have had the training necessary to complete the job. Any employer that would hire someone without a license is very reckless and would be risky to work for anyways. Having a license shows that an employee has been trained on the many safety procedures that come with the job. This prevents workplace accidents and protects the employee and saves the employer potential lawsuits. OSHA does worksite visits periodically, and they will want to see the forklift certification training papers on all employees. This ensures that the employee is compliant with OSHA rules and regulation. Not only that the time stamp lets them know how long it has been since the employee has been trained, and when they need a refresher course. This also saves the company money by not having to pay fines from having under-trained employees, or worse. If an unlicensed operator gets into an accident, the company could not only be heavily fined but could get shut down. Employees who are not properly trained have almost no chance of moving up within the company. 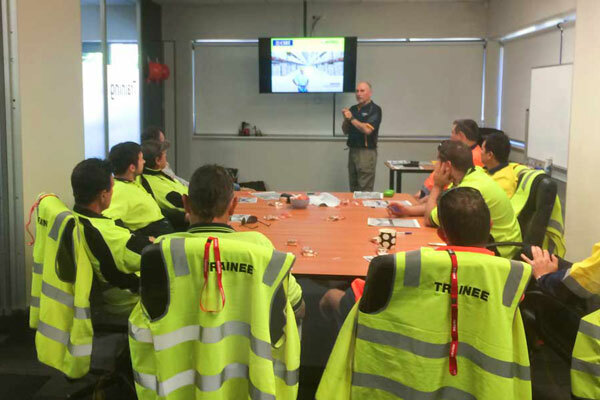 If you wish to become a forklift trainer yourself, then you will need to be qualified and go through the proper steps. 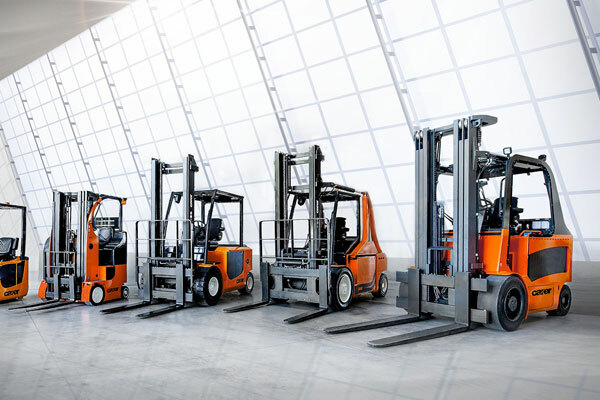 Making sure that employees are properly trained also saves the company because operators will be trained on how to maintain a fork lift, reducing the cost of sending machines to the mechanic shops. The last thing that you would want, as an employer is an employee wandering aimlessly and not knowing what to do next. Getting them properly trained prevents this scenario from happening, and in turn saves the company money and time. Basically the license protects both the employer and the employee, making them accountable to know the rules of the job. Getting your forklift license may be time-consuming and at times challenging. Once you get that license and start working for your job in New York, it will start to pay off. It can not only be a mentally rewarding job, but it also can be a financially rewarding job as well. In the United States, fork lift operators can expect to make a median of around $15 an hour. Obviously if you are reading this, you are looking to snag a job in New York, and you are in luck. Forklift operators in New York average above the national average at $16.50 an hour. So, all of that hard work will certainly pay off with a stable income plus benefits. Also if you work your way up and become a fork lift instructor or warehouse manager, you can certainly require a raise. Some may pay a fee for training, and some may be lucky enough to get free forklift training at their future warehouse. Either way it is more than worth it to get your forklift license in the state of New York. That’s all good but, how much does a Fork Lift Operator make in New York? Check the table below which shows fork lift operator’s annual base salary for 27 major cities in the New York region. Once you have passed the forklift driving test and achieved your certification, you wonder how long it last in New York. Well, the answer is generally every three years. I say generally because that is the time limit that is required for every fork lift driver to take a refresher course. If a forklift driver has been in a workplace accident, then they are required to be retrained, and pass the forklift test again. Anytime that an employee needs to be retrained on a new type of fork lift, he/she will also need to take a refresher course. This course will need to be especially targeted towards the type of forklift that the employee will need to be trained on. There are many great reasons to renew your license; the first one is for safety. A lot of rules and regulations could change within three years, so it is important to stay in the know. Also an employee could get too comfortable while on the job and simply forget the rules, so it is just wise to get a refresher. Renewing your license could be a great opportunity to gain extra knowledge to move up in your company. Although it can be time-consuming to get your forklift license in NY, it is not only necessary but can prove to be beneficial to your career. 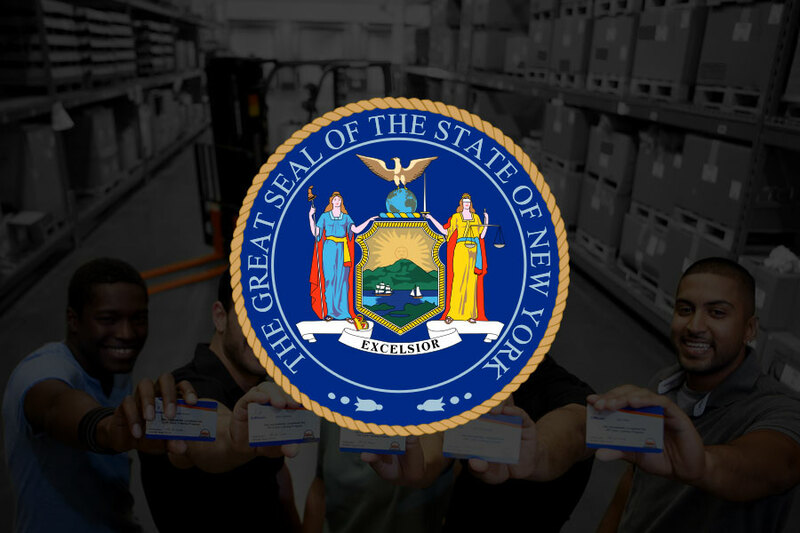 If you still have any question or need more information about forklift certification in New York state, then you can get in touch with the New York State Department of Labor or an OSHA Area Office in New York. It can be great working as a fork lift operator in the great state of New York. Once you get your forklift license in New York, then you can begin the hunt for a job. The state is filled with many exciting opportunities and chances to move up. You will find that the state has a higher average salary compared to more than half of the states and many other benefits. Obtaining your license and renewing it every three years can prove to be more than beneficial. Thanks for letting us know that with by going through a forklift license training program and getting certified, it is easier to get hired since the best employers want employees that already know how to safely and properly complete their work. My brother has been wondering if it might be worth it to go through a forklift license training course before looking for a new job. I’ll be sure to tell him that he should take the course since it will be more likely that a reputable employer will want to hire him if he has this certification to work this machine at his new job.